Traverse City Tourism, the community’s official destination marketing organization, has just released four in-language videos for German, British, Canadian and Chinese viewers. Created this past summer, the videos use on-camera hosts speaking in their native languages and telling the Traverse City story in their own cultural styles. International travel is booming, and destinations that seize the opportunity will benefit. This year, German, British, Canadian and Chinese travelers will learn about Traverse City’s vibrant culinary scene, its downtown shopping, its outdoor recreation, and the scenic wonders of the Sleeping Bear Dunes and the Old Mission Peninsula, thanks to a series of promotional videos just released by the local tourism organization. Traverse City Tourism, the community’s official destination marketing organization, created four in-language videos for German, British, Canadian and Chinese viewers this past summer, using on-camera hosts speaking in their native languages and telling the Traverse City story in their own cultural styles. The videos are part of an initiative by Brand USA, a public-private effort to encourage international travel to the United States. They were produced by Miles of Sarasota, FL in cooperation with Travel Michigan, and are being used for international market promotion in Canada, the United Kingdom, Germany and China. They will also be featured on Brand USA’s official website, http://www.discoveramerica.com. 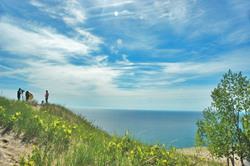 Traverse City Tourism has been involved in the international marketing effort for several years, as a partner with Travel Michigan and Great Lakes USA, a consortium of state tourism authorities in the Great Lakes region. To date, the effort has been concentrated mainly in Canada, Britain and Germany, but Michigan has recently begun a more vigorous outreach to the Chinese travel market.